Package-delivery company United Parcel Service (UPS) is launching its largest ever marketing campaign to promote its logistic business to small and medium- sized companies looking to export their products. For years, the company has been known worldwide for its slogan: "What can Brown do for you?" 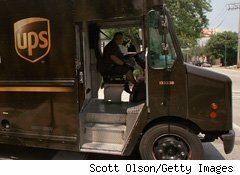 The Wall Street Journal reported that print, TV and digital-media ads in the U.S., China, Mexico and the UK will soon promote UPS logistics with the slogan "We [Heart] Logistics." Logistics are the critical steps that a company must go through to get its product to customers, including running a warehouse, shipping goods and clearing customs. CEO Scott Davis told The Wall Street Journal that the idea to promote logistics globally came partly from statistics showing that 70% of the company's U.S. customers export to just one country, usually Canada. "They are somehow intimidated by the cultural challenges of shipping to other countries," Davis said.